Punting. A summer (and increasingly, because of climate change) winter time activity enjoyed by many of the millions of visitors who come to Cambridge every year. Cambridge is famous for many things, including having one of the oldest and most prestigious universities in the world and the river Cam runs right through the heart of some of the most famous colleges that make up Cambridge University. Punting is big business and over the years a number of companies have been established to hire punts to tourists, whether on a self drive or guided tour basis. Some of those companies have survived and flourished, others have fallen by the wayside. In addition to these companies there have always been a number of independent punt operators plying their trade along the river. Starting in the early to mid 2000s repeated and concerted attempts were made to stop these independent punt operators from trading. These attempts were often made by the larger established companies in their attempt to dominate the market. 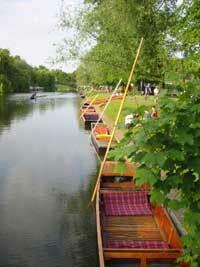 With those attempts having failed, Cambridge City Council attempted to enact measures that had they been successful, would have effectively spelled an end to independent punt operators in all but a token capacity and allowed the largest operator Scudamores Punting Company to operate without having to deal with any real competition. The original aim of this website was to ensure that this did not happen by raising awareness of the situation, publicising what is happening and getting information into the public domain. We wanted to be certain that whatever happened was done in a fair and transparent way that helped foster competition and did not put a large number of people out of work and threaten their livelihoods. Ironically, the measures enacted by the city council back then backfired massively and the net result was actually a huge increase in both touting in the middle of the historic city centre, and unlicensed, unregulated punt operators operating from an unrecognised punt station, causing havoc on the river. Over the course of the pages of this site you can find the history of the punting in Cambridge, leading up to the current situation. We have included an overview of the local area affected by punting, correspondence from various parties regarding what’s going and details of what you can do to help. Please note, this website is largely an archive at the moment from around 8 years ago. We are in the process of updating the design first and then (potentially) the content. In the meantime you might see some strange behaviour. Please bear with us while we make the changes.